Includes: 1 set of cables 3 m long terminated by Kelvin clamps, mains power lead, 9 user’s manuals (1 per language), 9 simplified user’s manuals (1 per language), MOT (Micro-Ohmmeter Transfer) data transfer software on CD-ROM, 1 x RS232 communication cable. Purchase a Chauvin C.A 6255 Microhmmeter and we'll give you a copy of Chauvin Arnoux's DataView Analysis Software (RRP £495) FREE whilst stocks last. 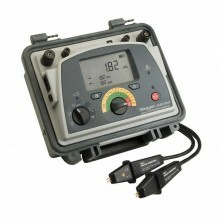 An easy-to-use, high-performance instrument, the Chauvin C.A 6255 10A micro-ohmmeter tests the quality of connections with precision (resolution of 0.1 µΩ) through the use of low resistance measurements. 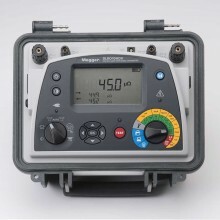 Housed in a rugged construction-site type case with cover, the C.A 6250 is a self-contained instrument powered by a rechargeable battery with built-in charger. It provides 7 measurement ranges, from 5 mΩ to 2,500 Ω, that can be accessed and selected directly on the front-panel rotary switch. 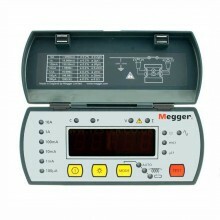 It uses the 4-wire measurement method, with automatic compensation of spurious voltages. This device is compliant with safety standard IEC 61010-2-030 and the leads are compliant with IEC 61010-031, for voltages up to 50 V with respect to earth in category III. NON-INDUCTIVE MODE - for measurements on resistors with a time constant of a few ms (contacts, metallisation, etc.). INDUCTIVE MODE - for measurements on inductive components (transformers, motors, etc.). NON-INDUCTIVE MODE - with AUTOMATIC trigger: for measurements on resistors without a time constant: for repetitive measurements in production, helping to gain considerable time. Protection of the operator when a resistance having a large inductive component (motor, transformer, etc.) is measured. Measurement up to 2,500 Ω, resolution 0.1 μΩ. Indication of the level of memory use. Indication of battery charge condition. RS 232 interface to print the results on a serial printer or export them to a PC. 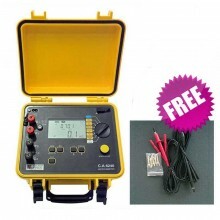 4-wire measurement with compensation of spurious voltages. 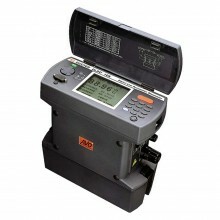 Measurement modes Inductive, non-inductive, non-inductive with automatic trigger. Temperature compensation By temperature sensor or manual. Operating temperature 0°C to +50°C. Max. voltage relative to earth: 50 V.
Dimensions 270 x 250 x 180mm. Chauvin C.A6255 warranty Two years.